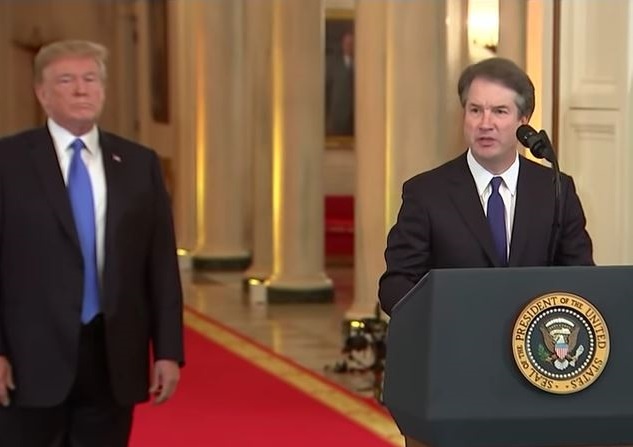 President Donald Trump introduces his nominee, Judge Brett Kavanaugh, for the U. S. Supreme Court. (TriceEdneyWire.com) – President Donald Trump has announced his choice for the next U. S. Supreme Court justice. He is U. S. Circuit Judge Brett Kavanaugh of Washington, D.C., a nominee who has already drawn fire from Democratic leader Chuck Schumer and the NAACP. The nomination is only the beginning. After lengthy hearings before the U. S. Senate Judiciary Committee, he will only be confirmed if he receives a majority of the Senate. Kavanaugh would replace retiring Justice Anthony Kennedy, whose decision to leave the highest court caught many by surprise and has ignited emotions ranging from alarm to panic to concern among civil rights, human rights, and women’s rights advocates, centrists and progressives. It has also produced undisguised jubilation within conservative circles at the prospect of a conservative, and possibly far-right, jurist being placed on the court. Wake Forest Law School professor Kami Chavis. Kennedy, 81, announced his July departure on June 27, which set in motion hurried efforts by President Donald Trump and Senate Majority Leader Mitch McConnell to select a nominee and begin the nomination process ahead of mid-term elections in November respectively. Kristen Clarke, president and executive director of the lawyers Committee for Civil Rights Under Law, agrees there’s much at stake with this Supreme Court vacancy. Clarke warns the importance of this appointment cannot be underestimated. Trump has been packing the lower courts since taking office and he has been aided by McConnell, who blocked Obama nominees and left them open for Trump to fill. McConnell refused to even consider or meet with Obama pick Merritt Garland and held that seat open for Trump to nominate Neil Gorsuch. In the past 15 months, the administration has retreated from the US government’s legal positions on voting rights and election law, on how workplace disputes are settled, and eroded labor union power, cast off provisions and protections for gay and transgender people. Attorney General Jeff Sessions has overseen restrictions and other limits on affirmative action and other legal remedies, advanced a hard line on immigration, and has pushed to reduce or eliminate women’s reproductive rights, and promoted sharp cutbacks on regulations. Dwight Kirk, a labor union veteran who’s also involved public relations, said Kennedy’s announcement and the implications for Black and brown people from an unsympathetic and indifferent right wing court harkens back to before the Brown v Board Supreme Court decision.